It started with Bill Sparkman , the part-time Census worker who went missing and then was found dead, setting off an avalanche of mainstream media and left-blogosphere accusations that he was the victim of anti-government “right-wing” hate. It turned out that Sparkman killed himself. . . The Sparkman accusations were based on nothing more than a desire to demonize the newly formed and rapidly growing Tea Party movement as terrorists and un-American. It was as if they were hoping for an act of Tea Party violence. Yet there was a theory behind the madness, the Eliminationist Narrative created by Dave Neiwart of Crooks and Liars about an “eliminationist” radical right seeking to dehumanize and eliminate political opposition. We can now add the Boston Marathon Bombing to the pile. The wild speculation that there was a Tea Party or “right-wing” connection proved false. Rest assured, Good Readers. . .these repeated failures by the Left's Eliminationist Narrative to explain unfolding events will not deter their allies in the media from attempting to frame the next (God forbid) terrorist attack as the work of the ever elusive right-wing operative. Jesus knows that his disciples are grumbling. They heard him say that they must eat his flesh and drink his blood to gain eternal life. They're grumbling b/c some seem to think that he means all this metaphorically. Like that time he talked about them being like sheep. Or that time he said they were all different kinds of soil that the seed of his Word fell upon. Some think this is all just a parable and that he's telling them that his teachings will sustain them if they will just treat his words like a daily meal, symbolic food to grow in wisdom. Others, the ones who were really listening to him, are disturbed. Deeply disturbed. Jesus didn't tell them that they must eat his flesh. He used the Greek word trōgōn. They must gnaw his flesh. Like a lion gnaws the flesh and bone of its prey. He knows that they are grumbling; so, he asks, “Does this shock you?” Now they are really worried. He continues, “The words I have spoken to you are Spirit and life. But there are some of you who do not believe.” John tells us, “. . .many of his disciples returned to their former way of life and no longer walked with him.” Metaphors, symbols, parables. None of these brings eternal life. Only the flesh and blood of the Lamb of God can feed a soul hungry for salvation. Our gospel reading this morning brings to an end the long lesson we call the “Bread of Life Discourse.” Jesus spends a great deal of time drawing together various lines of Old Testament thought and imagery to produce a picture of himself as the Lamb to be sacrificed for the salvation of the world. He pulls in the unleavened bread of Passover. He draws the exodus from slavery in Egypt and the manna that fed God's people in the desert. He colors his lesson with memories of exile, return, the bloody sacrifices of the temple. And then he concludes by shocking everyone with the most ridiculous claim, “Whoever eats my Flesh and drinks my Blood has eternal life. . .” We get the sense that most of those following him were with him in spirit until he utters this, this utterly revolting, impossible sentence. Is there anything more unclean to the Jews than cannibalism? Even touching a corpse, or just being in a tent with one requires seven days of ritual purification! Did this idea of gnawing on his flesh shock some of the disciples? You bet it did. And many of them simply walked away, returning to the lives they had left. NB. Deacon John is preaching this morning. Below is one of my Over the Top homilies from 2007. This is a style I often used back then b/c the audience was mostly college students. Maybe we can forgive the routine ignorance of the media and its oftentimes sensationalistic and even hostile portrayal of religious folks, especially Christians in the U.S. Our faith is not easily understood even by those who have been initiated into it and strive with God’s grace to live it day-to-day! And surely we can forgive those in the Church who would have us curb the enthusiasm of Christ’s Eucharistic teaching in today’s gospel. I mean, are we really helping ecumenical efforts at the international and national level by insisting on all this blood and guts imagery? Wouldn’t it be better to focus rather on the more genteel and less violent imagery of bread and wine? These are great symbols of earth and home and harmony and human work. Besides bread and wine helps to keep us focused “down here” on the domestic community rather than “up there” on an inaccessible Big Scary Father-God. Aren’t we here really just to learn to live together and help each other and be at peace with the environment? The quarreling Jews may have understood better then than we do sometimes now: “How can this man give us his flesh to eat?” This question actually belies substantial understanding! They understood Jesus to say “flesh.” Meat. Body. And blood. True food and true drink. Not mere symbols. Not just memorial signs. Not mere representational action in history. Not just an “absence of forgetting.” Real food, real drink for eternal life. And this is why they are shocked to hear Jesus teaching what can only be called cannibalism. I don’t think Jesus eases their fears any in the explanation of his baffling claim: “Whoever eats my Flesh and drinks my Blood remains in me and I in him…the one who feeds on me will have life because of me.” This is astonishingly clear and simple. And outrageously scandalous! From the beginning we have had immediate access to Christ’s body and blood in the Eucharist. His real flesh and real blood. We will not eat the bread of our ancestors this morning. We will eat the bread of life from the banquet table of the Father. We will eat…we will gnaw!...as children, heirs, as a people loved, we will feast on immortality so that we may become him whom we eat. There is no other reason for us to be here this morning than this: our transubstantiation into Christ. Just ask Paul: we will not all die, but we will all be changed! Isaiah prophesies: “O, Jerusalem, the friendless, the storm-beaten, the inconsolable. . .All your children shall be taught by the Lord; great shall be their peace.” Jerusalem, an abandoned wife and mother whose children live in exile, is prepared by the Lord for the return of her children. Isaiah sees the exiles flowing through the city gates, glad and rejoicing b/c with enduring love the Lord has taken pity on them and welcomed them back. He promises, “My love shall never fall away from you nor my covenant of peace be shaken. . .” Friendless, storm-battered, and inconsolable, the children of Jerusalem hear another promise: “Every weapon fashioned against you shall fail; every tongue that brings you to trial you shall prove false.” Out of these promises and the rejoicing of God's people in receiving them, Jesus recovers an ancient lesson not always well-learned: “Everyone who listens to my Father and learns from him comes to me.” Listening to the Father, learning from the Father, brings us to Christ b/c Christ is the culmination and fulfillment of the Father's plan to bring all of His children through the city gates of the heavenly Jerusalem. Do you listen to the Father? What do you learn? Listening and learning from what you hear requires a particular disposition, a specific sort of attitude. In old school Catholic moral theology, this attitude is called “docility.” Being docile is not a popular way of getting through a day these days. We've come to think of docility as an unhealthy passivity, a weakness of character, or a dangerous sort of submissiveness that threatens our dignity. Docile personalities are effortlessly manipulated by aggressive minds and dark hearts. Docile personalities are unreliable, unproductive, and liable to easily break. Consciously or unconsciously, the message we receive from the world is that docility is a guaranteed way of being trampled by those with no fear of consequences. It is far, far better to be cold, calculating, unyielding, and aggressively assertive. We must be like iron to survive in this hostile world. And that may be so. But when we adopt this attitude toward divine teaching we are essentially begging God to look at us and see hard hearts and mulish minds. We're asking Him to treat us like iron. And iron must be broken to be remade. Can we bring ourselves to sit docilely at the feet of Christ? Listen and learn? Or will we stand in stubborn resistance, demanding equality with God? The Christian virtue of docility is not a weakling's passivity before authority. Aquinas teaches us that docility is a cognitive virtue under prudence; that is, being teachable is a good habit b/c such an attitude helps us to learn to see ahead, to make the best decisions based on the best available evidence with the Good firmly in mind. Docility is akin to humility in that it helps us to recognize and accept the truth of our natural limits and encourages us to seek out God's wisdom in revelation. Repeatedly, the children of Jerusalem chose stubbornness over docility. Repeatedly, they closed their ears to God's word and refused to listen. Repeatedly, they made themselves into iron. And God taught them the only way that they would be taught: by being broken in exile and remade. B/c Christ came among us as the culmination and fulfillment of God's plan to bring us into His heavenly Jerusalem, we do not have to be broken in exile. He died and rose again; and in baptism, we are killed and reborn, broken and remade. If we will be docile at his feet, teachable to the divine truths he has to teach us, we will not only survive, we will thrive as His beloved children; and not only will we thrive, we know know His peace. Everyone who listens to the Father and learns from Him comes to Christ, the living bread, his Flesh for the life of the world. And there was great joy in the city! The Church in Jerusalem is being persecuted by the Jewish religious establishment. Peter and the Apostles are arrested twice and brought before the Sanhedrin to answer charges of heresy and sedition. Both times they are sternly warned to stop preaching and teaching in the name of Christ. Both times they defy the authorities and continue doing what they were sent by Christ to do. B/c the Apostles must obey God rather than men, the persecution is turning violent, and the Church is scattered “throughout the countryside of Judea and Samaria. . .” Saul is dragging Christians out of their homes and putting them in prison. By the standards of the time, none of this is particularly noteworthy. What is noteworthy is the reaction of the persecuted Church. We read in Acts: “Now those who had been scattered went about preaching the word.” Also of note is the reaction of those who hear and benefit from the apostolic preaching: “There was great joy in that city.” How does the persecuted Church defy the threat of prison and violence? How do we answer religious rejection and secular condemnation? We go about preaching the Word. The Church's extraordinary answer to persecution is extraordinary only if we fail to understand her purpose. If we believe that the Church's purpose is to create and defend a particular vision of western culture, then preaching the word in defiance of violent secular repression seems extraordinary. If we believe that the Church's purpose is to support the platform of a particular political party, or promote a particular economic system, then preaching the word in defiance of persecution seems extraordinary. If we believe that the Church's purpose is to provide us with a ready-made network of like-minded friends, business contacts, or just something to do on a Sunday morning, then preaching the word in defiance of the law, in defiance of all social pressure to stop seems more than just extraordinary; it's socially suicidal, downright dumb. However, since the purpose of the Church is to preach the word, preaching the word—even in defiance of persecution, esp. in defiance of persecution—is the most natural thing for her to do. Why? B/c when the word of God is preached, there is always great joy. The Good News of God's mercy to sinners always brings with it the blessings of freedom, healing, and peace. It is the Church's nature and purpose to preach the word “in season and out.” If that's not enough to explain her defiance of persecution, then let this be enough: “I am the bread of life; whoever comes to me will never hunger, and whoever believes in me will never thirst.” Where would the hungry go to eat the bread of life if not the Church? How could anyone come to believe if there were no witnesses giving testimony? The Church is in the world to be the living sacrament of Christ, to point to and make present his saving power among the nations. Jesus says, “For this is the will of my Father, that everyone who sees the Son and believes in him may have eternal life. . .” How does anyone in 2013 “see the Son” and come to believe in him? Through the teaching and preaching and sacraments of his Body, the Church—alive and well 2,000 yrs after his resurrection. In defiance of persecution, social ostracism, ridicule, corruption, scandal, exile, and occasional defeat, alive and well for 2,000 yrs, living in his resurrection to preach the Good News of God's mercy to sinners. Our purpose is not victory. God has already won. Our purpose is to tell the world that He has won, and that He wants us all, everyone to share in that victory through Christ, His Son. Though the idea that humans must becomes gods is hardly new, Nietzsche's divine obituary and Kierkegaard's wholesale abandonment of the possibility of rational faith, left us flailing about for a suitable Grand Narrative to replace God and Reason. Unfortunately, as a culture, we chose the decadent straight-jacket of modernist science and pragmatism. And western civilization has been in moral decline ever since. . . I've deleted the post about the explosions in Boston. . .just about everything that is being reported is either false or unconfirmed. . .I thought that the info was solid. Apparently not. However, the need for prayer is certainly solid enough! Finally, Archbishop Müller informed the Presidency that he had recently discussed the Doctrinal Assessment with Pope Francis, who reaffirmed the findings of the Assessment and the program of reform for this Conference of Major Superiors. So, despite his brown shoes, a love for tamborines, and being Jesuit, our Holy Father is still Catholic. What a Bull Dog can do to a baby. . .
OK. To make up for the Barbarian Baby Slaughtering Smurfs. . .I give you. 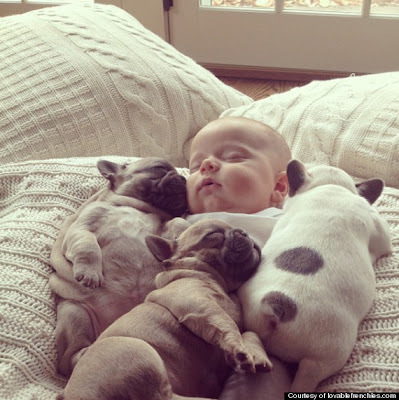 . .
Baby Covered in Bull-dog Puppies! If your glucose levels can tolerate it, go here for eight more pics just as Sugary Sweet as this one. This seaside scene btw Jesus and Peter brings to harvest a number of seeds planted by Christ in the hearts and minds of his disciples. Though Peter is the focus of this interrogation, the other disciples bear their own spiritual wounds and fruits as a result of Christ's teaching. Since he first said, “Follow me” to these fishermen, Jesus has taught them in word and deed to forgive one another, to be at peace with one another, and above all, to love one another. He's taught them to surrender themselves to God by taking up their crosses and bearing up under whatever burdens must be carried. He's taught them to remember him in the breaking of the bread, in daily prayer, in fasting and in taking care of the least among them. He's taught them that being first in God's kingdom means being last in the Enemy's; and that if they love him, if they are truly willing to die for love of him, they will feed those who follow him. Feed my sheep. Feed them with the bread of life. Feed them with the Word. Satisfy their hunger for heaven, their thirst for the truth. This seaside scene btw Peter and Jesus is not only Peter's reconciliation with his Lord, it is also his final exam, his last test as the Lord's favored student. * If you're interested in my take on why Jesus uses the phrase "more than these," check out this daily homily from 2008.